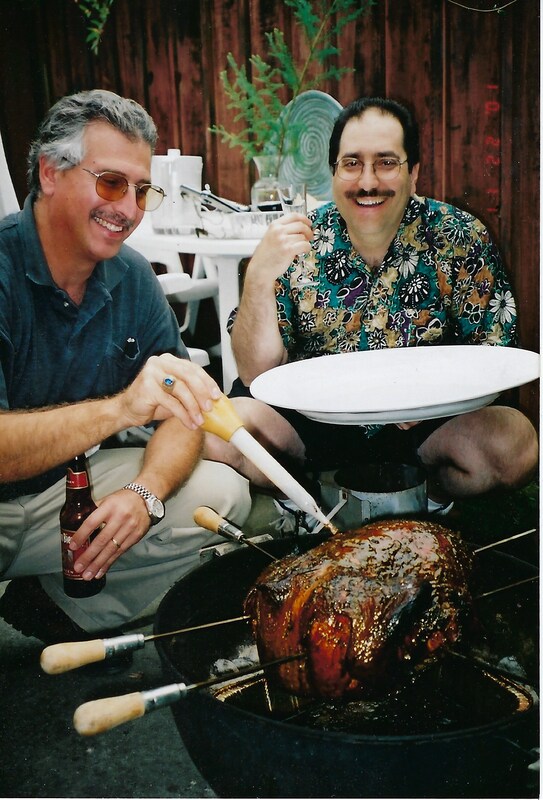 I used to barbeque the bird every year. It’s a great way to go. Nice smokey flavor, frees up the oven for marshmallow yams, and you don’t risk burning down your house with a deep fryer. 1400 homes a year burn down each Thanksgiving, according to the US Consumer Product Safety Commission. Barbecuing your bird is much safer than deep frying. The key to it is banking your coals properly, and running shishes through the bird. Being Armenian, I always have sturdy shishes in the house, though they are usually for roasting lamb Shish Kebab. But I found that by running three shishes through the bird, they would support its weight in the barbecue. Plus they give you an added advantage. This is the main advantage. To keep all the juices from running out of the top half, you flip the bird over halfway through. This keeps it nice and juicy while you’re locking in great smokey flavor with some hickory chips down in the fire. So a few years back, right when the coals were ready, disaster strikes. I’m holding the shished bird, about to cradle it gently onto the fire, when one of the three barbecue legs flops over. Holy Crap! Luckily I’m able to yell for help and keep the bird and the coals from crashing all over the patio. The strength of a Manic Impressive is not in the planning stage. We can hold a vision pretty well, but sometimes the details are better left to more cognitive types. But we are masters of improv. So while my wife jumped in the car to acquire a roasting pan, I set about improvising a way to keep the barbecue alive. I got out a mallet and knocked the remaining legs off. A few bricks later, we had a workable, legless barbecue, albeit a few feet shorter than its original form. So that’s how it came to pass that I roasted the bird on a legless barbecue. As you can see from the picture above, there was a lot of squatting involved, but the bird was delicious, and my brother-in-law got a great story to tell his friends. And that’s why I took a pass on my friend’s legless Weber. Because I have literally been there and done that already. This year we’re keeping it simple, and trying to keep the chaos out of the kitchen. Instead, we’ll try to keep the chaos at bay at the dining room table when the inevitable discussion on politics breaks out. We plan to use Saturday Night Live’s brilliant Thanks, Adele skit when politics come up. We’ll have it cued up and ready to go. I suggest you do too. You know the story they told you in Kindergarten about the First Thanksgiving? The Pilgrims were thankful they survived their first year in America so they threw a big party. They invited as their guest of honor a helpful Native American named Squanto. He taught them how to grow their crops and they all lived happily ever after. Aside from this, I’m guessing you don’t know squat about Squanto. This story isn’t a complete a bunch of hooey, but there’s a whole lot they left out. Squanto was a real person, but that wasn’t his real name. His name was Tisquantum and he was a member of the Pawtuxet tribe that lived in the area for 10,000 years before the white folks arrived. Typical American white people, the Pilgrims couldn’t pronounce his name correctly and called him Squanto instead. He was a hero for helping them survive the winter, but he was a far more complex and shady guy than they led us to believe in Kindergarten.